I am the one woman of a one-woman business in a very personal and high-touch industry: weddings. It's a beautiful thing to set my own schedule, choose my own projects and client list, and be able to grow my own business from the ground up. I feel lucky every single day to have found a profession that I can truly say I love. Many other wedding professionals run similarly small operations and though some have assistants, production support, or a small team, small remains the key. There are no payroll departments or customer service numbers to call. When you need something, you're often talking to the owner, the accountant, the artist, and the marketer all in one. One of the most wonderful things about working with a small business, like many you find in the wedding industry, is that every single interaction you have is personal. And that leads to personal final products. You often have the chance to meet in person, to speak over the phone, to build relationships with your wedding vendors that extend on into your married life (like the photographer who shoots your newborns or the stationer who creates your first baby's birth announcement). And yet - wedding planning can be so fatiguing. You find yourself signing on many a dotted line, signing many a check or sending many a deposit, and writing countless emails. Often it can start to feel anything but personal and that wonderful thing that drew you to a small business over a big corporation might end up getting lost in the shuffle of planning. 1. Each of my clients is extremely important to me. I know my clients names, often their profession, what kind of dog or cat they have. I chat with some of them long after their wedding - on Instagram or via email. Sometimes I work on the wedding invitation of their sibling or maid of honor a few years later. I remember names on their guest list. I remember their invitation long after it is sent. I stalk their photographer's website for photos of their wedding. I save a copy of their paper for my portfolio. Each client that books me allows me to do my dream job for one day longer. A client is not a bottom line or a number or a percentage. They're not a transaction. They're a partner in a long process where art is created and revised and lovingly printed, addressed and delivered. I am not a big box store or a giant online stationary store. Each couple has a folder on my desk, a box in my office, a place in my portfolio of work. 2. My end goal is always the same: a very happy client. I know that it can sometimes seem like after you've booked a vendor, paid a deposit, and started down the long road of proofs and revisions, that it can become less magical than you anticipated. If you need extra revisions or drafts or more centerpieces or more hours of photography or need to scrap everything and start over, you can find yourself subject to contract provisions or find yourself signing away more money for add-ons you didn't expect. This can make everything feel very impersonal and make you feel that your vendor doesn't have your best interest at heart. I promise you, we do. There is absolutely nothing worse than an unhappy client. If you didn't love your final product, it means I've failed at my job. If you come to me with complaints or issues, they weigh heavily on me. They often keep me up at night. I can't count the number of tears shed by vendors that felt they let a client down. When it starts to feel impersonal, know that contracts exist to protect both client and vendor. They're usually pretty industry standard (we do our research) and up-charges and add-on costs are calculated based on hours and materials required. They're not random figures we've come up with to deter you. They're not an attempt to price gouge. After years in our industry we've identified what works for most people and what is fair and honest in our own business. We wrack our brains for ways to make everything right. If you're unhappy at any point, we all want to do everything possible to rectify it. But we also have to be courteous to our other clients (whose time is equally important), courteous to ourselves, to our time, and to our business viability. 3. Your final product was made with attention, love, and care. When I am finalizing an invitation suite, I often reflect on how near and dear to me every single sheet of paper is. It all started with a phone call where I learned about a bride, connected on an aspect of their wedding or life. From there it turned into a back and forth about design and aesthetic. Sometimes a mother of the bride or fiance is looped in and I learn a bit about them as well. From there, I draw or paint or script your words and illustrations. They're done with focus and care and honed until they're perfect. Sometimes your name is written 20 or 30 times before I feel it is right. When your invitation suite proofs are sent to you, we collaborate again. We shift and tweak and modify and change colors. We examine postage. We discuss some more. And then, I prep your files for the printer. And they, my printer for a few years, know my work and preferences. When it's shipped back to me, it has been specially packaged and quality checked by them. I then handle every single piece. 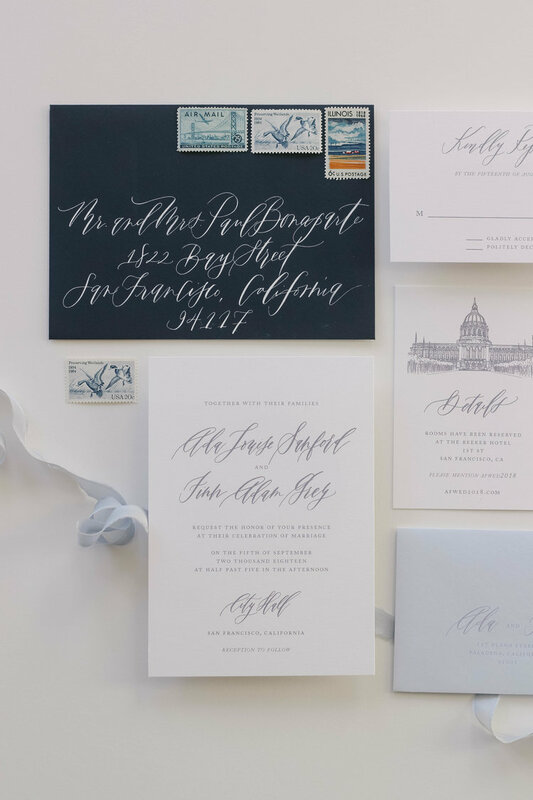 Hand-addressing envelopes, tying ribbon, sealing invitations. Some suites take over 8 hours to assemble alone - collate, tie ribbon, add a seal, add postage, stack neatly in a box. And then they're packed with special packaging I've crafted to make your box feel special to you. It can feel like I'm losing a little bit of myself when I send your items off. I miss them when they go. When your receive your box, know that so much attention and care went into every single piece. Know that we do wait to hear if you received everything. To hear if you're happy. To hear your guests reactions to their paper. Your paper is always personal to us. 4. I am in this business because I love what I do, not to get rich quick. If I wanted to get rich quick, I would have picked a different profession. I am a calligrapher because I truly and absolutely love what I do. Nothing makes me happier than wet ink on slick writing paper. Than honing a style, than scripting someone's name 20 times to get it right. I love paper. I love envelopes. I love color. I am a calligrapher because I wouldn't like to be anything else. When you see your quote and feel shocked at what everything costs, know that I keep my costs as reasonable as I can (so that you can afford beautiful stationary) while still earning enough to pay my rent. I'm not Uber who charges surge pricing in the snow or after a game. I'm not Amazon who can afford to take a loss on shipping because of their size. I'm not a luxury fashion brand whose name can command thousands higher than other products of comparable quality. I am one person who has spent countless hours honing my pricing and doing market research to make it fair for both of us. In reviewing a quote know that your paper comes from one company, your seals from another, your postage from yet another. Know that we pay printers (often more than we're making) to print up your gorgeous suite. Know that we pay shipping (at normal postage rates, without the luxury of Amazon's free 2-day shipping) to get your items to us and from us and back again. Know that every hour we spend emailing you or calling you or designing for you is an hour that we love, but an hour that we can't spend with someone else. 5. There's a real person behind the screen. When you email a large company like Comcast or Amazon, there is an employee behind the screen that is paid every day to respond to your complaints. They have a script, an outline of how to handle common issues, and they get to go home every day and not worry about how that customer service interaction affected the success of the massive company for which they work. When you email a small business owner (like me), you're emailing me. I get to read your message in full and respond to anything you need. Behind the screen is someone who has invested their whole self (and time, and money, and life) into this business. Your opinion and thoughts and words matter and very directly impact my success. Kind emails make my day. Happy clients make me float into the next day. Wonderful clients make me feel as if I've made a new friend. In a similar vein, nasty emails are hurtful. Rude emails make me rehash endlessly where we went wrong. The things you're writing and saying are going directly to a person who truly cares. It's so powerful to be able to connect with the actual business owner rather than a customer service line - quicker resolution and personal attention - but please remember that we're reading your message and taking it all to heart.